Countdown launched its 2014 Report on June 30, 2014, at the Partners’ Forum of the Partnership for Maternal, Newborn & Child Health (PMNCH), held in Johannesburg, South Africa. Countdown was a co-sponsor of the Forum, together with PMNCH, A Promise Renewed, and the independent Expert Review Group (iERG). The 2014 Report, Fulfilling the Health Agenda for Women and Children, was released exactly 18 months to the day from the deadline for the Millennium Development Goals at the end of 2015. Like previous Countdown reports, it includes an updated, detailed profile for each of the 75 Countdown countries, which together account for more than 95% of the global burden of maternal, newborn and child death. The report shows that progress has been impressive in some areas, but it also highlights the vast areas of unfinished business that must be prioritized in the post-2015 framework. 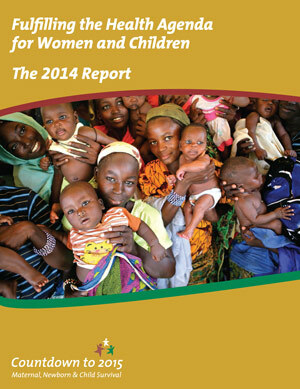 The 2014 Report also provides an assessment of the state of the data to support evidence-based decisions in women’s and children’s health, and describes elements of the Countdown process that might inform ongoing efforts to hold the world to account for progress. It concludes by laying out concrete action steps that can be taken now to ensure continued progress for women and children in the years ahead. Out-of-pocket financing – who pays for health care? Note: 2014 country profiles for individual countries (along with country profiles from earlier years) are available here. The data and results used to construct Countdown’s reports and profiles are publicly available. Data for the 2014 Report and profiles will be available for download soon. For more information about Countdown’s datasets, please contact the Countdown Secretariat at countdown@jhu.edu. The most updated country data on the coverage indicators tracked in Countdown are available at www.childinfo.org.